It is the largest heroin bust in Ohio history, according to state officials. 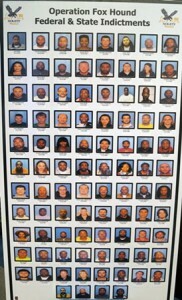 Ninety-two men and women have been named in a 203-count indictment according to the Cleveland Scene, all accused of playing various roles in a drug trafficking ring that brought heroin in from other states to area addicts and residents. “These defendants used firearms and violence to fund an operation that brought heroin and the death it causes from across the country into Greater Cleveland,” said U.S. Attorney Steven Dettelbach at a press conference. Dubbed “Operation Fox Hound”, the investigation involved multiple agencies at the local, state, and federal levels. The demand for heroin in Cuyahoga Counties and beyond is growing and it’s being fueled by heroin trafficking and a steady supply. This collective effort by the defendants to bring heroin into the area would begin in cities like Atlanta and Chicago, both named as points of origin for the drugs. The defendants involved in this drug ring are accused of not only fueling the local heroin epidemic, but also of using violence to do so. Charges on the indictment include everything from heroin trafficking to the possession of firearms and money laundering. As is true in many other locales across the country, the heroin problem in Ohio is on the rise. The rising numbers of heroin arrests, emergency room visits, and treatment center admissions is due in part, ironically, to law enforcement crack downs on the prescription drug trade. Oxycodone, the “drug of choice” for many in recent years has gotten harder to get a hold of, and more expensive. Heroin, also an opiate, has rushed in to take its place and is able to provide a much more intense high for a fraction of the cost. As evidence of that, Dr. Joan Papp of the MetroHealth Center Emergency Room says the same people who are showing up for heroin overdoses are those who would have been using oxycodone or similar prescription opiates just a few years ago. “We’ve noticed a lot more heroin users in the ER…and you’re not seeing the lower rungs of society, you’re seeing young, middle-class people from the suburbs,” she explained. Criminal penalties for these defendants, should they be found guilty, will be serious. Even possession of heroin can land you in prison. Possessing less than a single gram of heroin is still a felony charge. If you’ve been arrested for heroin possession or any felony drug charge, contact our offices to see how we might be able to help.